ST. LOUIS, June 21, 2018 /PRNewswire/ — HarrisLogic, a technology and clinical services company that develops solutions to improve patient care in behavioral health, is partnering with the Zero Suicide Institute (ZSI) to create a new, digital platform to provide comprehensive suicide prevention services. This specialty behavioral health services platform is the first of its kind, and is designed to support and enhance the Zero Suicide approach for safer suicide care. 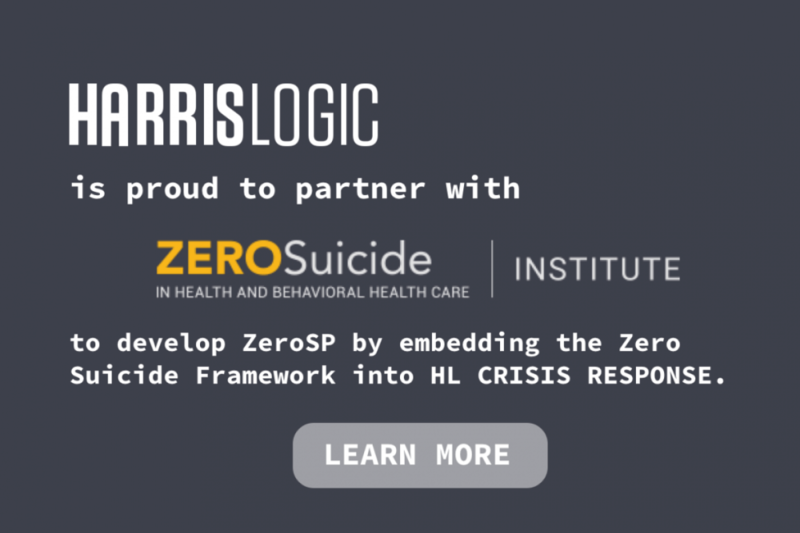 HarrisLogic’s technology will support the development of a Zero Suicide clinical workflow that a health care system might use to trace suicide care efforts. Known as the “Zero Suicide Platform,” the digital solution will be implemented across hospital and healthcare systems, and offer features including best practice workflow, screening and assessment tools, risk and level of care calculators, intervention modules, and data analytics. Transition: Transition individuals through care with warm hand-offs and supportive contacts to provide a wide-ranging, digital solution for clinicians treating persons at risk for suicide and / or persons experiencing behavioral crisis. Built and modeled on decades of experience in clinical settings, HarrisLogic developed the Crisis Response platform back in 2006 to help guide mental health professionals in providing suicide prevention services. Through this partnership with ZSI, HarrisLogic will be able to implement best practice tools to further improve the quality and quantity of services provided. The Zero Suicide Platform is currently in development and will be launched over the next 12 months. For more information, visit http://www.harrislogic.com/. HarrisLogic is a technology and clinical services company that develops solutions to help healthcare professionals make clinical decisions for mental health patients. Founded in 1998 on the belief that technology can improve mental healthcare, HarrisLogic develops transformative, data-driven solutions for social impact, specifically in the areas of suicide prevention, crisis response, and recidivism. We collaborate with clinical, operational and civil liberties experts to build products that save lives and optimize the use of critical resources. To date, HarrisLogic solutions have tracked more than 1,000,000 crisis encounters and supported nearly 100,000 face-to-case encounters. For more information, visit http://www.harrislogic.com/.